What have you done since you left RMC in May 2015. After RMC I moved around quite a bit. Within a week of graduation, I reported for duty at 3 Wing Bagotville in Quebec’s Saguenay region. I was posted there for six months and completed my on the job training (OJT) during this time. Initially, I was a bit worried spending six months in a French environment as my French profile was BBA at the time but 3 Wing Telecommunications and Information Systems Squadron (3 WTISS) welcomed me with open arms. In hindsight, this was by far the best first posting as it took my fear of speaking French in front of francophones. During my time at CFB Bagotville, I had the opportunity to be part of Ex Phoenix Warrior at 5 Wing Goose Bay which prepares troops for instances where they have to set up a forward operating base and be completely self-sufficient for a certain duration of time. I also took part in Ex Gypsy Wanderer at CFD Mountain View where members of 8 Air Communications and Control Squadron (8 ACCS) practice assembling camp and use their portable communications and radar equipment in desolate and austere conditions to setup a network enabled airfield. I was then posted to Kingston, ON to the Canadian Forces School of Communications and Electronics (CFSCE) in January 2016 to finish my final phase training as a Communications and Electronics Engineering (CELE) Officer. After successfully finishing my trade qualification, I am now posted to 8 Wing Trenton with 8 WTISS. I currently hold the position of Service Management and Configuration Control Officer (SMCC O) where I supervise the 8 Wing Trenton Helpdesk, the QL4 ATIS technician training and look after all the communication projects around the largest Air Force base of Canada. Can you reflect on your RMC experience? RMC shaped me into who I am today. Progressing through the four years of RMC, I gained a lot of experience and polished various skills from leadership, to communication, to time management skills. Small things like working on PDRs to being OPI for events at RMC gives one valuable experience that is beneficial in the individual’s post RMC life. I was fortunate enough to be CSL of 2 Squadron during my final year at RMC. The same concepts of leading a squadron apply after RMC when you are put in charge of troops at an operational wing/base. What do you miss the most about RMC? Easy access to your friends! It was really easy at RMC to take short breaks and just walk down the hallway and socialize with your peers. This is something I miss the most about RMC but I can truly say that the friendships I made during my time at RMC will last forever. What advice can you give to the soon to be graduates? Although RMC has a focus on the four pillars, it is still a university. I urge the fourth years to stay focused and meet the requirements of all the four pillars and don’t let your academic grades drop. One doesn’t realize this until they are graduated from RMC that these grades matter for higher education (i.e Masters). You are not doing yourself any favor by just barely passing the academics pillar if you plan on furthering your education in the near future. At the same time, make sure to have some fun. This is the year when you say your final goodbyes to a lot of your fellow graduates and future officers. Make sure to maintain the close friendships. Excellent advice, Sarab! Congratulations on all that you are achieving in your career. That’s good advice, Sarab! Congratulations on all that you have achieved so far! 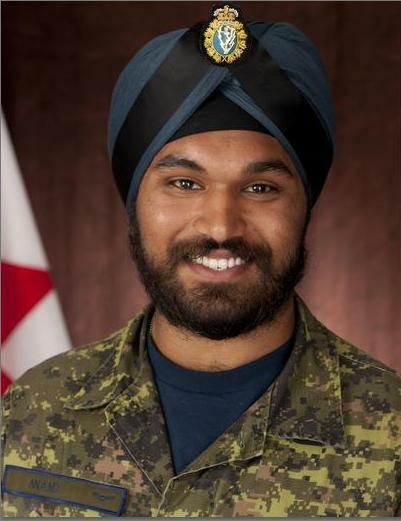 Bravo pour ton nouveau travail et pour tes nouvelles responsabilités au sein des Forces armées canadiennes. Merci pour ton témoignage au sujet de ton passage à Bagotville et de l’expérience que tu y a vécu; je suis contente de voir que ta formation en langue seconde t’a permis de bien t’intégrer auprès de tes collègues francophones. Bonne continuation dans ta carrière !